The 4th of July is the perfect opportunity to teach your kids about America's Independence and express your patriotic spirit. Use our year three 4th of July worksheets to get some fun themed maths and vocabulary practise, from 4th of July word searches, to crossword puzzles to multiplication printables. 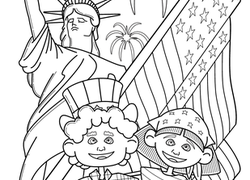 When they are finished, find more 4th of July worksheetsTo continue the festivities.